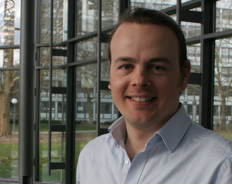 Our first new academic is Dr. Guillaume Delaittre who took up an independent position of Junior Group Leader at the Karlsruhe Institute of Technology (KIT) in Germany by 1st of March 2013. His research will focus on nanostructured polymeric materials for biotechnological and biomedical applications. He has received funding for 5 years from the German Ministry of Education and Research (BMBF) to create his academic position, fund PhD students and postdocs, and run his lab. We invited him to write an essay to describe his pathway and share his experience. His story is summarized below, while the full essay can be found here. I was born in 1979 and grew up in a small town not far from the Channel Sea in Picardy, France. I enrolled at the University and obtained a 2-year diploma in Sciences of Matter with honors. I then integrated the Institut de Science et Technologie of the University Pierre et Marie Curie. After I completed my degree of Ingénieur there with a six-month traineeship as junior project leader at Cray Valley, my Polymer Chemistry professor, Bernadette Charleux, recruited me for my Master on the topic of controlled emulsion polymerization. Having worked really hard on my exams to obtain a fellowship, I was then able to continue with Bernadette and Maud Save (at IPREM, in Pau, France since 2007) on the same topic for my PhD. As a PhD student I realized the importance of regularly following the literature, especially as a way to gain inspiration. The numerous scientific discussions with Bernadette and Maud also taught me a great deal about how to properly conduct a study, critically evaluate results, and extract the very substance of it. Towards the end of my PhD it was clear that I wanted to become an academic. I liked the freedom that this field offers, as well as the possibility to create (at least in chemistry) something new, even if I sometimes wonder whether it is still possible! In January 2008 I successfully defended my PhD thesis. The next month I moved to Radboud University Nijmegen (the Netherlands) in the group of Roeland Nolte, co-advised by Jeroen Cornelissen (now in Twente, the Netherlands) and spent a little less than 2 years there as a post-doc. Afterwards, I have received an Alexander von Humboldt fellowship and started working in Christopher Barner-Kowollik’s research group in June 2010 in Karlsruhe. How did I finally come to this position? Through a combination of circumstances actually: the right time, the right place, the right boss, the right profile, the right amount of publications… Along almost two years I have applied unsuccessfully for several grant applications. Patience is another required quality in academic research. Towards the end of 2012 I obtained funding from the BMBF for five years in the frame of Biotechnologie 2020+, a national research programme. I will work jointly with Christopher’s team and the Institute of Toxicology and Genetics (ITG) at the KIT. During this long process, my former supervisors helped me with their kind recommendations, young group leaders I did not know provided me with grant proposal examples, and Christopher, Uwe Strähle (head of the ITG), and Jürgen Hubbuch (coordinator of the grant application) continuously showed me great support and reassurance. I also presented my project to several researchers of the KIT who gave me advice and agreed to collaborate with me: this was undoubtedly instrumental to the successful awarding of funds. Now, when I think about how I personally came to this point, I must say that I became a real fan of the field I chose to work in. Since my PhD, when I am not physically at work, I very often think about the current and possible future projects. I would like to finish with a quote of a professor of Polymer Chemistry who, not so long ago at a conference in Obernai, told me with his Southern French accent: “On est chercheur à l’Université, on est libre: on n’a pas à se plaindre!”. I AGREE. IF YOU WOULD LIKE TO READ TO FULL VERSION OF GUILLAUME’S STORY PLEASE FOLLOW THIS LINK!!! As always-very interesting to read article of Dr. Guillaume Delaittre!